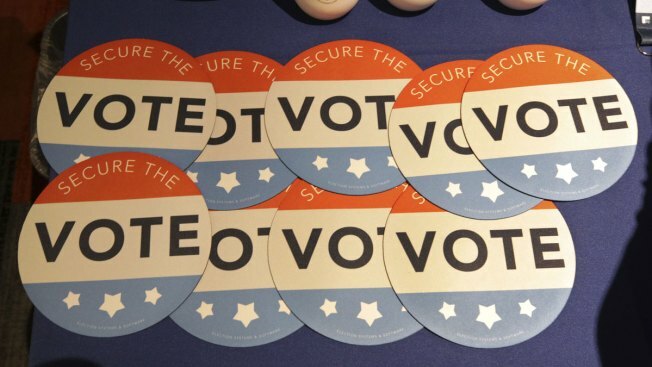 This July 14, 2018 photo shows computer mouse pads with Secure the Vote logo on them, displayed on a table at the Election Systems & Software vendor at a convention of state secretaries of state in Philadelphia. Two deadlines are coming up this week for Virginia voters who want to cast an absentee ballot for the November election. The Department of Elections says voters have until Saturday to cast an absentee ballot in person at their local voter registration office. Qualifying reasons to vote absentee include pregnancy, a religious obligation or personal business or vacation outside where you live on Election Day. Voters who want to mail in an absentee ballot have until 5 p.m. on Tuesday to request one at their local voter registration office or online . To be counted, the ballots must be returned by 7 p.m. on Election Day, which is Nov. 6.